The appeal of this form of dieting is that it enables us to lead normal lives on five days of the week and appears to be quite flexible in how you use it. I am guessing that many of us have done variations on a theme around this diet, I know I have soup only days when I want to lose weight quickly and I can remember my parents having fruit only days for the same reason. What was interesting about the 5:2 diet TV programme was that not only do you lose weight, you also potentially improve your overall health. And, although we are all calling it a diet at the moment, I suspect it is actually a life eating plan. Now, I’m not a doctor and nor am I having the IGF-1 marker monitoring that Michael Mosely followed. I do have one minor ongoing health problem, a slow-acting thyroid (for which I take a low dose of thyroxine), and for that reason, I will check with my doctor in the next few days that this diet is not harmful to me. But, in principle I don’t see why it should be as it is not a total fast, nor are you forbidden to eat any particular food type. I’m also curious about how the results of this form of diet management might be linked to the recent research into a ‘cure’ for diabetes which involves a very low calorie diet over a longer term. 2 pieces Smoked Haddock Fillets of smoked haddock, preferably the undyed sort. Wrap the haddock in foil and bake in the oven for 10 minutes at 170c. If you prefer, you can poach the haddock gently in a little milk for just a few minutes or grill it on one side only. Your aim is not to cook the fish through, just to start the cooking process. Make up the rarebit mixture by beating the egg with mustard, worcester sauce and chives. Then add in the cheese and mix well. Add milk as necessary so that you have a thickish mixture you can spread over the fish. If necessary, brown the rarebit under a hot grill for a few minutes before serving. I like this with spinach but for a more substantial version you could serve mashed potatoes and perhaps buttered cabbage. This is a low calorie dish, especially if made with half fat cheese. 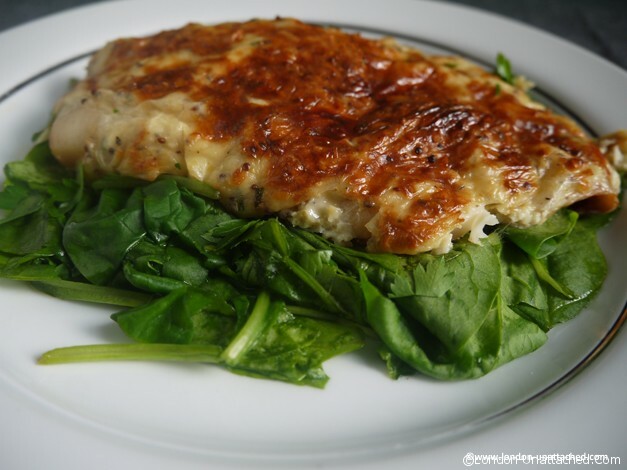 Today’s 5:2 diet recipe and meal is smoked haddock rarebit. I love rarebit on toast and I’ve made enough of the mixture for lunch later in the week. But, adding haddock makes a very special dish that I was introduced to by James Martin. He made his rarebit rather differently, pre-cooking it on the hob, chilling the paste and then cutting out slices to lay on top of the fish. I’ve done a simpler version, using the rarebit mix I’ve made since I was a student that I would generally put on bread. 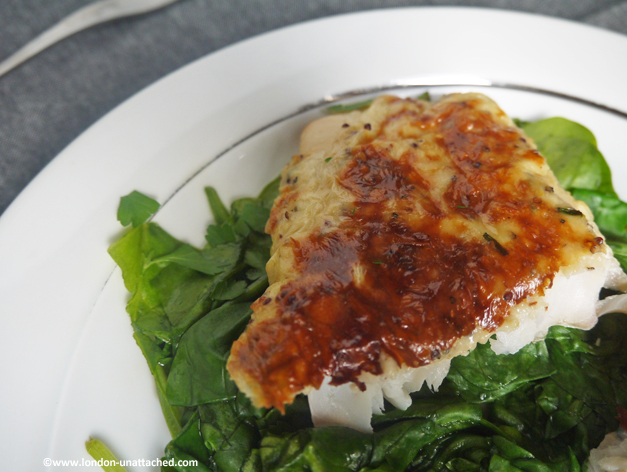 I added a few chives for extra flavour and I served this with steamed spinach, which is a lovely contrast to the smokey, salty fish. I’m very lucky because I was sent the smoked haddock by Delish Fish and it is incredibly well flavoured and tender. I’m also using low fat cheddar, where I’d normally use the full blown variety, to cut the calories and my very rough calorie count for the meal works out like this. That’s a total of 355 calories for what feels like quite a substantial 5:2 diet meal, helped a lot by the haddock which is a very low calorie fish. My dieting history is a bit piecemeal. I’ve tried a few diet plans but I never manage to do them for long. I am not a great fan of ketosis inducing diets like Atkins. I’m concerned that anything where you have to put a huge pressure on one or two of your body’s vital organs (in this case the kidneys and liver). And in any case, it’s very difficult to write restaurant reviews and limit your food to the Atkins diet. For me, low carb, low fat diets DO work, but are very, very hard to stick to because on certain days I eat out, sometimes twice. And I get a fair amount of food (chocolate) to review at home too. Probably my biggest failing is wine, I enjoy drinking with a meal and I cook quite a lot with wine, so there’s often the good part of the bottle left for me to finish! But, I have no problem avoiding wine on two or three days a week…and the advantage of doing that on a ‘5:2 fasting’ day is it stops me picking at chocolates and drinking lovely but calorific fruit cocktails instead of the wine. I also think having a couple of days of eating very little cuts your appetite overall. So – my aim over the next month is to lose 4-5kg (8-10lbs). At the moment, for my age and height (I’m 155cm) I am at the top end of overweight, though not yet into the category called obese. I’m away on holiday from the 15th September to 22nd and I’d really like to drop a dress size by then so that my pretty summer clothes fit without stretching at the seams. I currently weigh 65kg and when I first started doing this I was 66kg, so I DID lose a whole kilo in the first few days. Once I get to 60kg I will be happy, if I can reach my target weight of 57kg I will be thrilled (I’m 155cm). I exercise regularly (usually 4 times a week) and I’m changing my routine to include more resistance training because I understand that muscle wastage is one of the potential issues of this diet. Over the last week, my gym routine has been 10 minutes of power plate (squats, lunges, steps, plank) followed by 15 minutes of interval based aerobic exercise, followed by 10 minutes of weights/resistance exercise followed by 5 minutes of power plate relaxation. That seems to work in terms of toning and my tummy feels a bit flatter! On fast days I’m not currently exercising, but I am trying to make sure I take a 20-30 minute walk. I might change that, when and if I get more used to the routine but as things stand I find exercise makes me feel very hungry and I suspect I’d cheat on the basis of calories burnt at the gym! Day 2 of fasting for the 5:2 diet has gone OK so far. I’ve discovered that drinking a lot of water is important and when all else fails, zero coke is quite good at filling me up! Good luck to everyone else trying the 5:2 Diet to lose weight. Do let me know your own ideas! probably won’t be at FBC12 (I am in sicily the week before) but let me know if you are around London. I do think this is a practical diet for someone who works with food…albeit a bit hard! Hi Fiona, interesting post. It is do-able as a weekly plan but I still don’t get the science! Doesn’t the body just go into starvation mode for two days then into overdrive when you ‘feast!’ – I guess a little more research is needed. I am hoping Dr M will write a book explaining! I saw that programme too and decided to try it given diabetes runs in the family and I suffer from high cholesterol. Unfortunately we had guests over the weekend and so there was quite a lot of food, alcohol and eating out involved in the 3 days they were here. However, in total between the programme and the weekend I lost 5lbs and over the weekend I put under 1lb back on… so so far it seems to be a winner for me. I already follow a healthy diet though so fasting for a day isn’t a big issue for me, I can see some might not find it easy to fast for a day though. well done Angie! I’m rather enjoying the recipe side of it…but, I have to admit I found it hard on a working day when I had to sit at my desk all day! …) I have lots of herbals, do some juicing (my fav is green lemonade), water and the occ coffee/tea. I also (although this is no good for you) grab a small handful of nuts when I want to snack. Lovely recipe I was just reading a Welsh Rarebit recipe at the checkout in a store today which I memorised. Would never have thought to put it on fish but will definitely try this now so thank you for the idea! I watched that on catchup yesterday, today was a big family blow out day, but tomorrow I am thinking I might start. I don’t think I can cope with a fast day when I am out working, so I will decide on the two days each week depending on my schedule. I agree that I think this is a life style choice in the long term, but initially I would just like to see if a month of eating like this would be feasible. Good luck to us both!